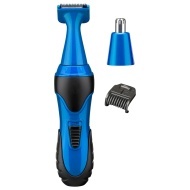 alaTest ha raccolto ed analizzato 13 recensioni su BaByliss For Men 7180 Hygiene 3-in-1 Mini Trimmer. La media della valutazione per questo prodotto è 4.4/5, confrontata con la media della valutazione di 4.3/5 per altri prodotti. Abbiamo analizzato differenti valutazioni di esperti ed utenti, età del prodotto ed altri elementi. A confronto con altri prodotti, BaByliss For Men 7180 Hygiene 3-in-1 Mini Trimmer ha ottenuto un alaScore™ complessivo di 88/100 = qualità Molto buono. The Bayliss trimmer works very well in all uses. Well done. I am happy with the product as it does what it said and the price was very right for the product. The only point you need to be careful when using it, as I shaved a part of my eyebrow. Bought as a replacement for a Philips Trimmer which ahd failed after several years. In fairness the Babyliss Trimmer is much cheaper but the nose is not as effective, The hair trimmer comb is very difficult to attach. Am very happy with performance ,really great product. Very pleased another super product from JL delivery excellent overall very pleased.